At the end of the Vallée des Ormonts, dominating the resort, the Les Diablerets mountains are the high point of the Vaudois Alps. The long-shaped glacier, situated between Les Diablerets (alt. 3,209 m), the Quille du Diable (alt. 2,850 m) and the Oldenhorn (alt. 3,123 m) is accessible almost all year round. From the Col du Pillon, a cable car takes you to the middle station first (Cabanes des Diablerets, where the cable car coming from Reuch in the canton of Berne also arrives), then another cable car whisks you along the cliff on a 1.6 km cable up to the top of Scex Rouge (alt. 2,965 m). Spectacular! Dive into the heart of the Vaudois Alps, in a world of changing scenery with narrow passes and the most diverse geological formations, along with vast high altitude pastures and tranquil mountain lakes. 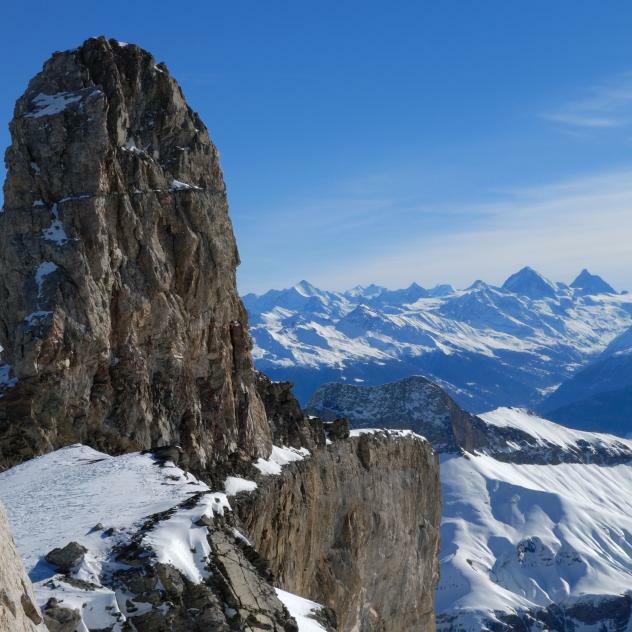 With one constant landmark: the impressive mountainous dome of Les Diablerets, topped by its sparkling glacier.